Great location to live or a holiday letting opportunity. Quiet and friendly apartment complex alongside Sawtell Village – 150 m to beach. The holiday accommodation market is booming on the Coffs Coast and Sawtell is the most sought after location. This property would sleep 4 guests easily. Other apartments in the complex have commenced taking bookings and are enjoying great booking numbers and rates. Situated in a super convenient location, this landmark building is finished to a high standard of fixtures & fittings. Features include fully ducted air conditioning, video intercom from apartment to the main entry, secure car parking and a secure lift access. Living areas and bedrooms are all on one level so if stairs are a problem for you then these apartments are perfect for you. 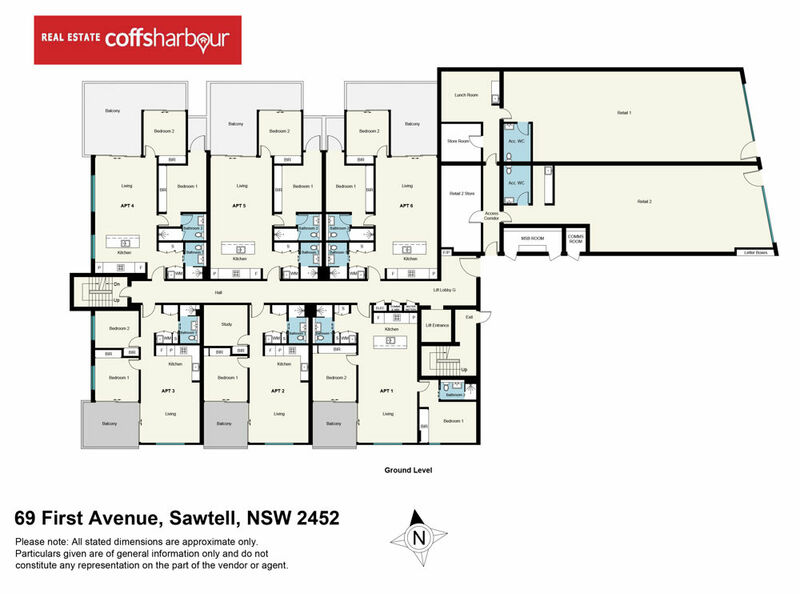 Apartment 2 – 69 First Avenue Sawtell has been designed for open plan living with the indoor living areas leading to a covered outdoor balcony, integrating the indoor and outdoor areas seamlessly. Internal/external living areas 76 m2 plus there is a single car space and a storage cage. Views are towards the shopping village and the fig trees in the main street. The design incorporates a modern kitchen with stone bench tops, Bosch appliances, master bedroom with BIR, large bedroom sized study with BIR, main bathroom, separate laundry & linen cupboard. The 2.7 m high ceilings provide a great sense of space. Access to the secure parking is off Kidd Lane and once inside, you can access to the lift with your groceries, straight to your apartment level. Strata Fees: $443 per quarter.